Programs for motivating employees, like employee development, opinion surveys, goal setting and team retreats, don't work if this very BIG and important "thing" is missing: Job Fit. (2) the interests, talents and strengths of the employee in the job. When the employee's strengths do not match what the job needs for superior performance it's like having someone who's too short to see over the steering wheel or too big to fit in the car. They can drive for some distance in the vehicle - but before too long they'll either feel too uncomfortable and quit, or have an accident and you'll need to let them go. When you have great job fit between employees and their job, your programs for motivating employees like team retreats and workshops will have the impact you intend. When you don't have great Job Fit everyone (the employee, the manager, the employee's teammates and customers) is uncomfortable. Any programs you offer with the intention of motivating employees who are NOT a fit for the job, will NOT work. I review each of these four areas of Job Fit in more detail below, using our car analogy. The first Job Fit area is the experience, knowledge and background needed for superior performance on the job. Right now you're probably thinking, "Duh, Suzie, I know that candidates have to have the knowledge and experience for the job! I know to look for that..."
I know you know because this is the Job Fit area most interviewers are very good at figuring out, since it is the the baseline for hiring a person. Getting Job Fit between what the Job Needs and what Candidate's know how to do, IS important. 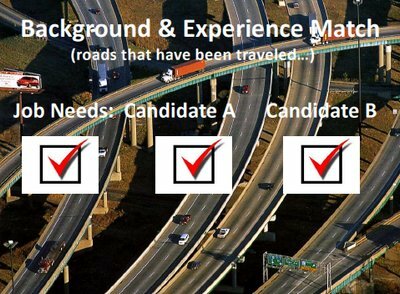 In our car analogy for hiring - the work experience needed for the job and the experience the candidate's have is represented by the 'roads that have been traveled'. Most interviewers already they think about the experience the job needs and then compare Candidates (like A and B, below) to see if they match or meet requirements. But is your ability to determine Background and Experience Match really a problem? Think back and recall all of your past low performers. What's were the main reasons your low performers were not doing well? Studies tell us that about 10% of low performance is related to an employee's lack of experience and knowledge. In most cases not having the right experience is NOT the problem.While background, experience and knowledge IS important, there are additional Job Fit areas that require your attention IF you want more motivation in the workplace. That brings us to the Second Job Fit area which is the communication and interaction style needed for superior performance in the job. When using hiring assessments and in my interview training workshop we look at what daily communication and interaction style is most needed on the job (ie: extrovert or quiet detail-oriented person? etc...) and we focus on matching the candidate's natural style with what the job needs. In our car analogy for hiring - Communication Style is represented by the 'how someone drives'. 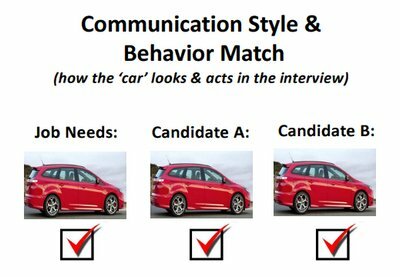 If the job needs a "red" car, and the candidates 'act like a red car' in the interview - then the interviewers believe they have the right match. And while Communication Style match does matter and it is another important check in the hiring process, like background and experience, there is a problem if you stop at experience and personality match to do the job. How many times have you hired someone who had the experience, who said all the right things and 'seemed so right' in the interview, but after you hired them they didn't work out? If you've experienced that, here's why - because experience and style, while important to superior performance, are not enough to determine if someone is a good fit for the job. If you want an entire team of superior performers you've got to begin looking for match in two additional areas: Motivators and Acumen/Personal Skills. That brings us to the Third Job Fit area which is to make sure you have a match between what the work in the job rewards and the true motivators and interests of the candidate. When using hiring assessments or in my interview training workshop we also look what the job will reward (for example: following the rules or thinking outside the box? etc...) and we focus on matching candidate's natural motivators with what the job needs. In our car analogy for hiring - motivators represented by the 'what kind of gas is needed in the car to make the 'want to go'. If the job rewards "following rules and procedures", and your candidate is not naturally motivated to do that - then he or she may not be a good match for the job. Knowing what 'gas is needed to go' and having a match between the job and employee is a crucial element for motivating employees. 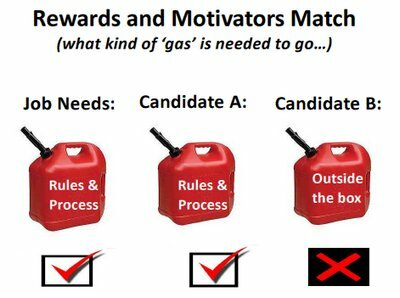 As you look at the gas cans and compare the motivators for what the Job Needs to Candidates A and B, you can quickly see that Candidate A is a much closer match to the Motivator Job Needs than Candidate B. Candidate A (who's a Motivator Match) would benefit from, but probably NOT NEED, company programs for motivating employees. That's because Candidate A is naturally interested in and motivated by what the job rewards, and s/he would more than likely be motivated already. Candidate B (who's NOT a Motivator Match) WOULD NEED TO GO TO all of your motivating employees classes, retreats and lunches but might NOT benefit. S/he would probably come back to the job after attending very expensive training programs, and continue working with low energy, waning interest and inconsistent performance. Candidate B is NOT motivated by what the job rewards and would more than likely not stay motivated on the job. would be low. S/he is is NOT a good fit motivation-wise. That brings us to the Fourth Job Fit area which is the personal skills and acumen needed by the job for superior performance. Personal skills are things like: teamwork, objective listening, attention to detail, personal accountability, job ethic, results orientation, customer focus and self-management skills. A lack of these important personal skills make up most of the problems you have with low performers, like: inconsistent performance, the inability to get along with others, not following directions and a lack of integrity. 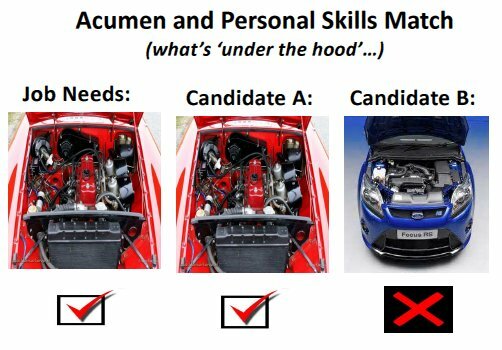 In our car analogy for hiring - personal skills and acumen are represented by the 'what's under the hood' . If the job needs a certain type of engine (personal skills/acumen) and the candidates do not match that - then s/he may not be a good match for the job. You can see below that Candidate A's engine is a much better match to the what the Job Needs in this area. 1. Get really good at focusing on Job Fit when hiring and promoting people. 2. Determine if the people who are not performing well in the job are even a Fit to the Job. Remember: If the employee is not a strong match in all four Job Fit areas: Experience, Communication Style, Motivators and Personal Skills - the money you spend on different development programs for motivating employees will be wasted, they'll have little impact and everyone will STILL be uncomfortable afterwards. We developed this Self-Paced, Audio MP3 & Workbook Online Program: How to Conduct an Interview from all of the material we teach in workshops and based upon the work we do with hiring assessments. This Program will help you avoid interview mistakes and hire the right people. We'll show you how to create a dashboard for your positions and how to build a superior performance worksheet, give you a 6 step interview meeting agenda, provide 170 of the best interview questions, and much, much more! For more info, review How to Conduct an Interview, here. #1: Focused, Productive & Truth-Revealing Candidate interviews. #2: Superior Performers Who Excel in the Job and Stay With You. #3: Powerful & Productive On-boarding of New Hires. Contact Suzie to schedule a Complimentary Consulting Call to learn more, here.